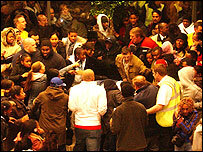 Several people were hurt in the crush as thousands flocked to the midnight opening of Ikea's newest store. The company blamed the chaos, in the early hours of Thursday, on "an unforeseen volume of customers". Tottenham MP David Lammy said Ikea should have known offering cheap prices in a deprived area would cause a rush. Mr Lammy told BBC News the adverts, calling for people to arrive before 0300 GMT to get the best bargains, were put up in Tube stations in the area and would have reached a large number of people. He said: "Ikea must have known that in opening the store next to the second most deprived constituency in London and by leafleting the area about knock down bargains for those who arrived first, people would flock to their store in large numbers. "They did not put in place the right infrastructure to deal with that." He said he did not think the store should reopen until health and safety standards had been checked. An Ikea spokesperson told BBC News they would not be reopening until safety issues had been considered and doors damaged in the rush repaired. The company also said it was "deeply shocked, upset and concerned" and blamed a queue "surge" for the crush. Bargain-hunters even abandoned their cars on the A406 north circular causing severe traffic problems, police said. Advertising announcing cut price offers over 24 hours attracted between 4,000 and 6,000 people to the store, according to the London Ambulance Service. Eye-witness Patrick Passley told BBC News there was a lack of security and trouble flared when queue-jumpers got into the store past some customers who had been waiting outside since about 1800 GMT. He said: "They (Ikea staff) quickly closed the doors after a lot of people got in by jumping the queue. "People became agitated and eventually they started trying to charge the doors." Patricia Ming said when the doors opened one woman "pushed her way forward screaming with excitement" then the crowd rushed in through the doors. "The doors remained opened for at least 15 minutes while crowds barged through the doors and the security guards just stood out the way as otherwise they would have been trampled," she said. 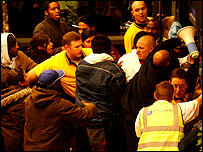 Ian Burlinson, of north London, said he was thrown to the ground as people surged forward and had to be rescued by a passer-by. He said: "It was all very chaotic and extremely distressing." Met Police Commissioner Sir Ian Blair said his officers had been taken aback by the number of people who attended the opening. "It was something that the Metropolitan Police were as taken by surprise (by) as the Ikea management," he said. "When we have any future (store) openings we will talk to them about it." Founded in Sweden in 1943, the company has proved a hit with British homeowners since opening its first UK store in 1987.